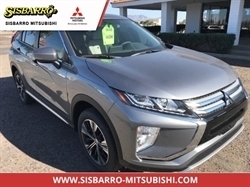 Bronze 2018 Mitsubishi Eclipse Cross ES 4WD CVT 1.5L I4 Turbocharged DOHC 16V LEV3-ULEV70 152hp New Tires, New Brakes, Nonsmoker, Power Package, Power Mirror Package, Automatic temperature control, Radio: AM/FM 7.0`` Touch Panel Display Audio, Steering wheel mounted audio controls. Hello, I would like more information about the 2018 MITSUBISHI ECLIPSE CROSS, stock# X739. Hello, I would like to see more pictures of the 2018 MITSUBISHI ECLIPSE CROSS, stock# X739.